The higher ocean resolution for ensemble forecasts in IFS Cycle 43r1 results in forecast fields that reveal more detailed features and fit more snugly along coastlines. 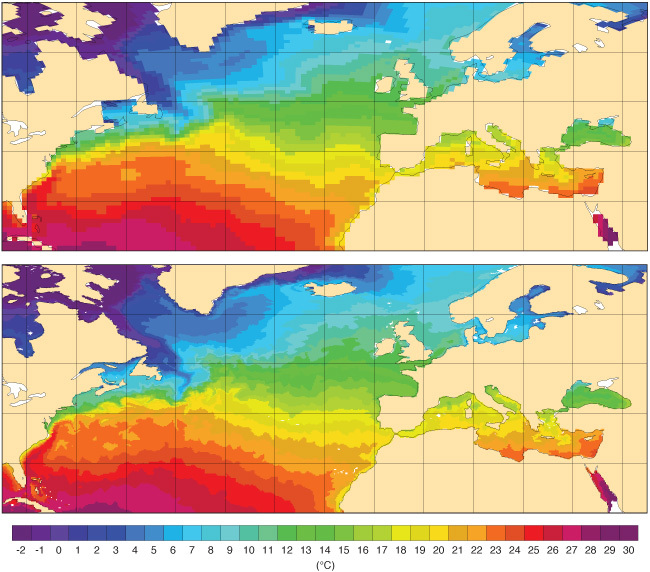 This is illustrated by these forecasts of daily mean sea-surface temperature for 18 November 2016, initialised at 00 UTC on the same day, using the previous model version (top) and the new model version (bottom). ECMWF implemented a new version of its forecasting system on 22 November, which introduces a dynamic sea-ice model and increases the resolution of the ocean model. These and other changes to the Integrated Forecasting System (IFS) significantly improve the Centre’s weather predictions. The interactive sea-ice model in the new IFS Cycle 43r1 is used to produce ensemble forecasts in which the atmosphere, oceans and sea-ice are dynamically coupled. Ensemble forecasts provide a range of likely scenarios and give an indication of the degree of confidence we can have in the forecast. initialized at 00 UTC on the same day, using IFS Cycle 43r1. Bringing additional Earth system components into the model and developing ECMWF's ensemble forecast capabilities are important elements of the Centre's new ten-year Strategy. Introducing interactive sea ice also makes it possible to predict changes in sea-ice cover during the forecast. In the previous model version, sea-ice cover was left static up to forecast day 15. 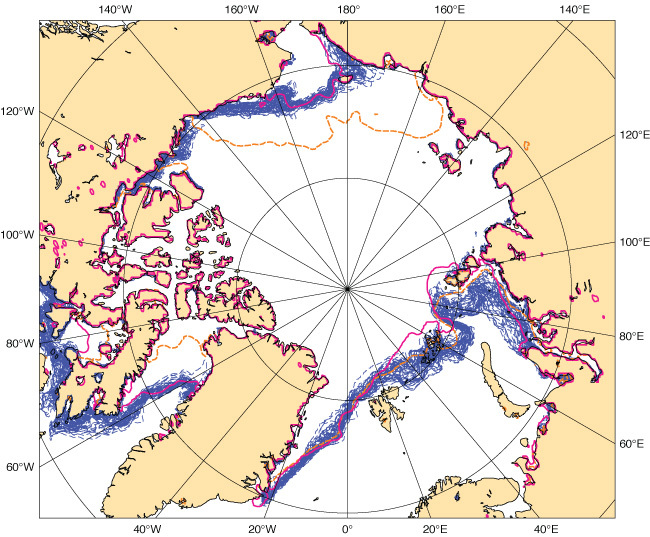 Dynamic predictions of sea-ice cover produce very different results from the assumption of static sea-ice cover. This is illustrated by this two-week ensemble forecast from 2 November 2016 (blue lines), which shows a significant evolution from the initial conditions (dashed orange line). Subsequent verification (pink line) shows that the dynamic forecast is much closer to observations than the static sea-ice cover. The spread of the blue lines gives an indication of the range of likely scenarios given inevitable uncertainties in the evolution of atmospheric and ocean conditions. The sea-ice model is LIM2, the Louvain-la-Neuve Sea Ice Model developed at the Belgian Université catholique de Louvain. It is part of the NEMO (Nucleus for European Modelling of the Ocean) modelling framework also used at ECMWF to model the ocean. In another significant development, the resolution of the ocean model used in ensemble forecasts has gone up from 1 degree and 42 layers to 0.25 degrees and 75 layers. This means that small-scale ocean circulation features are better captured and coastlines are better resolved than previously. Other innovations include changes in the representation of some low-level clouds to reduce cloud cover bias, and in the coupling between the surface and the atmosphere to improve 2-metre temperature forecasts. There are new cloud and freezing level output fields for aviation; a new sun-following radiation output for solar panels; and eight new wave model output fields, including the magnitude and direction of the wave energy flux that is responsible for the impact of waves on coastlines and offshore structures. Improvements in forecast skill can be seen in a range of weather parameters. These include 2-metre temperature, in particular in ensemble forecasts, and 10-metre wind speed over the ocean. There are also consistent gains for total cloud cover in the tropics as well as the extra-tropics. In particular, IFS Cycle 43r1 reduces the model’s tendency to predict too much cloud at high latitudes during winter. Improvements in cloud cover bias are particularly noticeable at high latitudes. The plot shows the percentage change in total cloud cover bias in the new IFS cycle for 48-hour forecasts compared to observations for the period November 2015 to January 2016. Negative values mean a reduction in bias; -100% means the bias has been completely eliminated over that period. The new IFS cycle brings a range of other changes which improve the performance of specific parts of the forecasting system, including indications of severe weather. The Extreme Forecast Index (EFI) flags up the risk of extreme weather compared to a reference climate for the relevant region and time of year. One of the changes in IFS Cycle 43r1 is a more accurate representation of the reference climate. This leads to the elimination of spurious EFI signals in some situations. The charts show 10-day EFI forecasts for 2-metre temperature at the northern tip of the Red Sea initialised on 8 November 2016. In IFS Cycle 43r1, the representation of the EFI reference climate has been improved. Spurious EFI signals in the previous version (left) are thus avoided in the new version (right). The modelling changes, together with changes in data assimilation and in the use of observations, also bring improvements to high-resolution and ensemble forecasts of upper-air parameters. In the extra-tropics, error reductions in the order of 0.5–1% are found for most upper-air parameters and levels. The gain in the skilful range of ensemble forecasts of 850 hPa temperature in the extra-tropical northern hemisphere (defined as the lead time at which the Continuous Ranked Probability Skill Score drops below 25%) is about 0.5 hours. The gain in the skilful range of high-resolution forecasts of 500 hPa geopotential in the extra-tropical northern hemisphere (defined as the lead time at which the anomaly correlation drops below 80%) is about 1 hour. Full details of all the changes in this model cycle are available on the web page on the implementation of IFS Cycle 43r1.